This book is somewhat in the nature of an autobiography, covering as it does almost the whole of the Author's life. 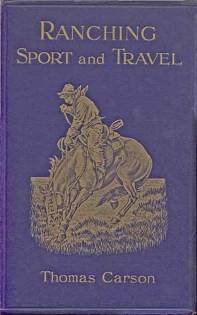 The main portion of the volume is devoted to cattle ranching in Arizona, New Mexico and Texas. The Author has also included a record of his travels abroad, which he hopes will prove to be not uninteresting; and a chapter devoted to a description of tea planting in India. Get this fascinating ebook in PDF format for just $1.00!